Baroness Scotland served as HM Attorney General from July 2007 to May 2010, the first woman to hold that position. She was the first black woman to be appointed Queen’s Counsel and, at the age of 35, the youngest woman ever to take silk. She has now returned to full time practice at the Bar and is available to take instructions in a range of areas. Baroness Scotland QC served as HM Attorney General from July 2007 to May 2010 she has vast experience in a range of areas including Constitutional Law; Anti-Corruption; Strategic Advice; Family Law and Human Rights. Advising governments on constitutional reform and maintenance of the rule of law. She has also advised on a range of civil and criminal justice matters around the world. Particular expertise and experience in advising Commonwealth governments. Extensive knowledge of the Bribery Act 2010. Advising companies and governments on compliance and implementation, including drafting protocols for governments and other organizations. Providing strategic advice to global companies on a range of issues, including corporate governance, compliance with gender equality legislation and corporate social responsibility. Particular expertise in cases with an international element. She appeared in the Supreme Court in the case of Re E (Children)  UKSC 27. Extensive experience in resolving difficult and intractable cases on behalf of children and parents. Advising governments on compliance with international human rights conventions, including the European Convention on Human Rights and the International Convention on the Rights of the Child. In 1991 at the age of thirty five, she became the first black and youngest woman ever to be appointed Queen’s Counsel and the youngest person to be so appointed since Pitt the Younger. She was the first black woman to be appointed an Assistant Recorder, Deputy High Court Judge, Recorder, Master of Middle Temple, Member of the House of Lords, Lord’s Minister, and is the first and only woman to have been appointed as HM Attorney General for England Wales and Northern Ireland in the 700 year history of that Office. From 1999 – 2001 she was the Parliamentary Under Secretary of State at the Foreign and Commonwealth Office where she was, inter alia, responsible for North America, Caribbean, Overseas Territories, Consular Division, British Council, Administration and all Parliamentary business in the Lords, where she established, amongst other things, a Forced Marriage Unit. In 2001 she was made a Privy Counsellor, appointed as Parliamentary Secretary and made deputy to the Lord Chancellor. She was the Minister responsible for Civil Justice and all of the reform of civil law including the comprehensive reform of land registration. In 2003 she was appointed as Minister of State for Law Reform and Criminal Justice at the Home Office and deputy to the Home Secretary. She served in that post until 2007 under three Home Secretaries: David Blunkett, Charles Clarke and John Reid. Whilst at the Home Office she was responsible for major reform of the criminal justice system. In 2007 she was appointed as Attorney General for England Wales and Northern Ireland. After the conclusion of the Northern Ireland Agreement she was appointed as Advocate General for Northern Ireland. As the Attorney General she was the Chief legal adviser to Her Majesty the Queen, Parliament and the Government, Supervisor and Superintendent of the Prosecutorial Authorities (SFO,CPS, RCPO), Leader of the Bar and had non statutory oversight of the prosecutors in government departments, the Treasury Solicitors Department and Armed Services Prosecuting Authority. She was Guardian of the Rule of Law and Public Interest. She was one of the three Cabinet Ministers responsible for the Criminal Justice system and had specific responsibility for fraud policy and the National Fraud Authority and chaired the Inter-Ministerial Group responsible for the improvement of the response to fraud and e-crime. During her time as Minister, she led sustained efforts to reform the laws on corruption. She helped to shape the Fraud Act 2006 and as Attorney General, she became a government authority on eFraud and corruption. This led to the eventual creation of the Bribery Act 2010. In 2009 she was presented with an award for her work on anti-corruption at the UN Conference in Doha. 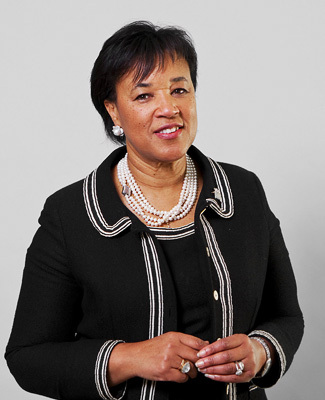 In opposition, Baroness Scotland QC served as Shadow Attorney General until October 2011. She remains the Principal Legal Advisor to HM’s Loyal Opposition. She has advised on a range of issues including the UN’s stance on Syria, the use of drones, the Enterprise Act and the European Union, in particular state aid. In 2011 she was awarded the lifetime achievement award by Euromoney Legal Media Group at the European Women in Business Law Awards. She has now returned to full time practice at the Bar.